Dosso Dossi (c 1489–1542), Sibyl (1524-25), oil on canvas, 69 x 64 cm, The Hermitage Museum	Государственный Эрмитаж, Saint Petersburg, Russia. Wikimedia Commons. You’re no doubt familiar with the best-known sibyl, the Oracle of Delphi – a woman with the ability to foretell the future, usually in some sort of mystic trance. This article looks at how this very pagan priestess and her kindred became popular figures in European Christian art. Late classical literature lists ten main sibyls: Persian, Libyan, Delphic, Cimmerian, Erythraean, Samian, Cumaean, Hellespontine, Phrygian, and Tiburtine. To those post-classical writing adds a Hebrew sibyl, to whom were attributed various Jewish prophecies. Around 500 CE, early Christian writings adopted the idea, and the classical sibyls were claimed to have prophesied the coming of Christ. Needless to say, there are no references in the Biblical corpus or even New Testament apocryphal writings. Sibyls appear in late mediaeval miniatures, but they started to flourish with the Renaissance, in its sometimes bewildering fusion of classical pagan myth and Christian narratives. The first printed editions containing accounts of Christian sibylline prophecies originated in Augsburg in 1545, and quickly became sensational. Further collections were published in 1546 and 1596, providing abundant source material for painters and their patrons: these are the Sibylline Books. Rogier van der Weyden (1399/1400–1464), Sibyl of Tibur (1445-50), left wing of the Bladelin Triptych, oil on oak panel, 91 x 40 cm, Gemäldegalerie der Staatlichen Museen zu Berlin, Berlin, Germany. Wikimedia Commons. Among the first major paintings of a Christian sibyl is the left wing of the Bladelin Triptych, painted by Rogier van der Weyden in 1445-50, and showing the Sibyl of Tibur. She stands at the left, looking up at her vision of Christ’s future, shown in the image of the Madonna and Child beyond the window. She wears a headdress which characterises her as ‘eastern’. The artist’s reference must have been an early manuscript version of material which was later incorporated to form the Sibylline Books. 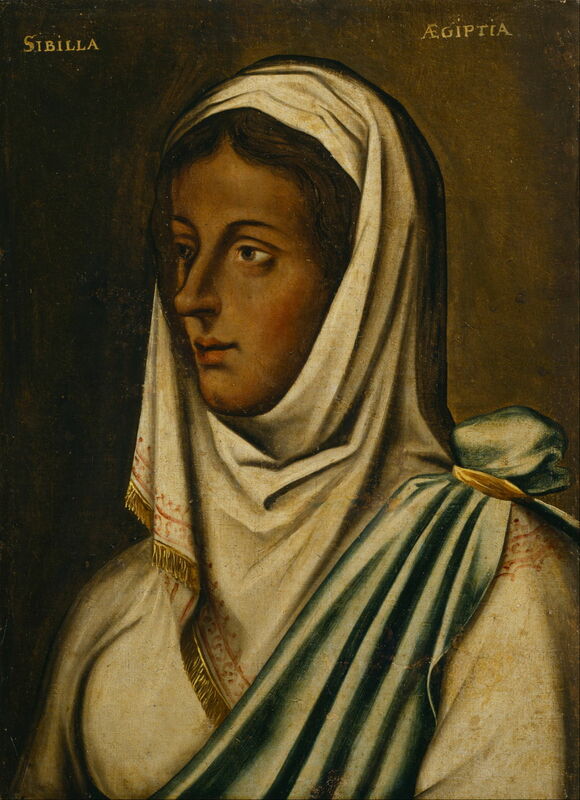 Domenico Ghirlandaio (1449–1494), Sibyl Agrippa (c 1480), fresco, dimensions not known, Sassetti Chapel, Basilica of Santa Trinita, Florence, Italy. Wikimedia Commons. 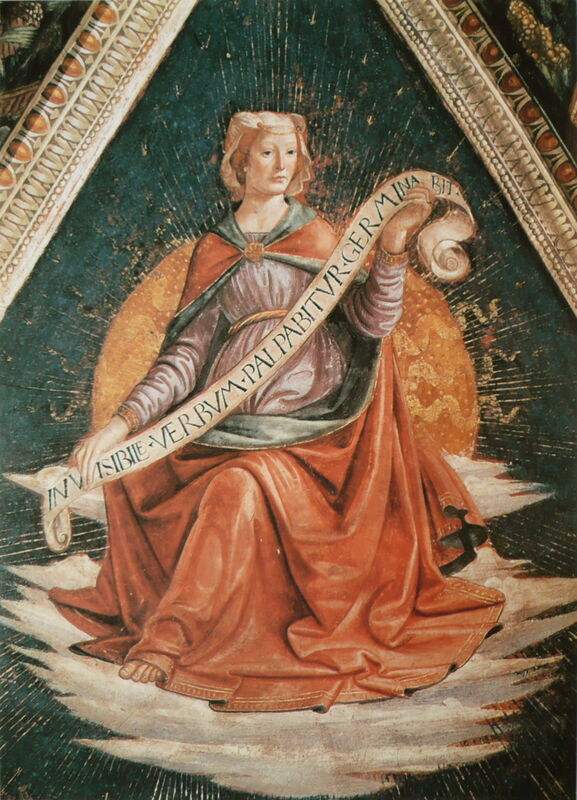 Working in Florence, Domenico Ghirlandaio painted this fresco Sibyl Agrippa in the Sassetti Chapel in 1480. 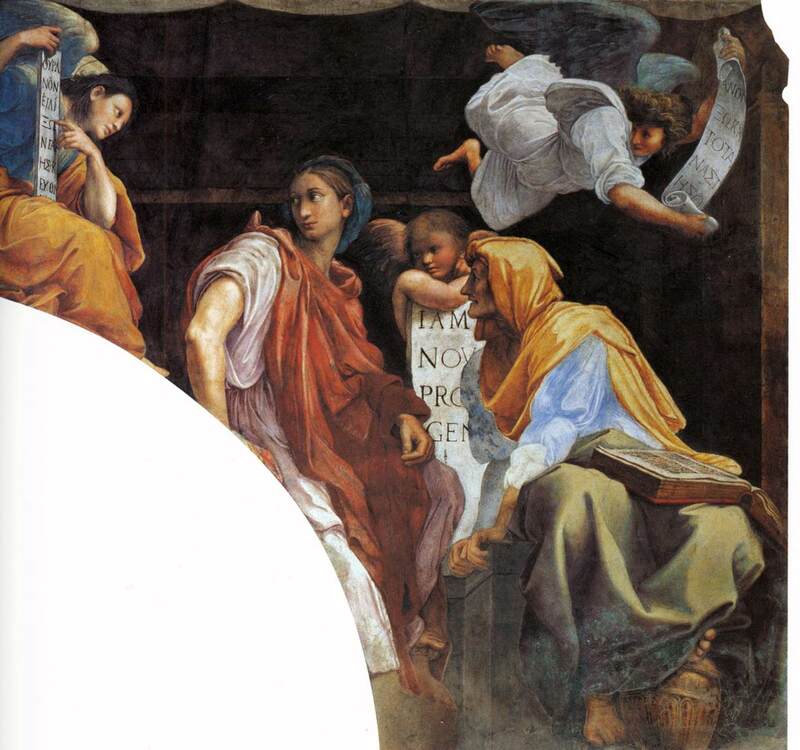 This is one of the first depictions in which the sibyl holds a scroll with prophetic words inscribed. She wears an ‘oriental’ headdress, and around her are mystical symbols. Soon afterwards, Andrea Mantegna’s marvellous distemper and gold painting of A Sibyl and a Prophet (c 1495) made the association between these prophetic women and the well-established tradition of Jewish prophets. 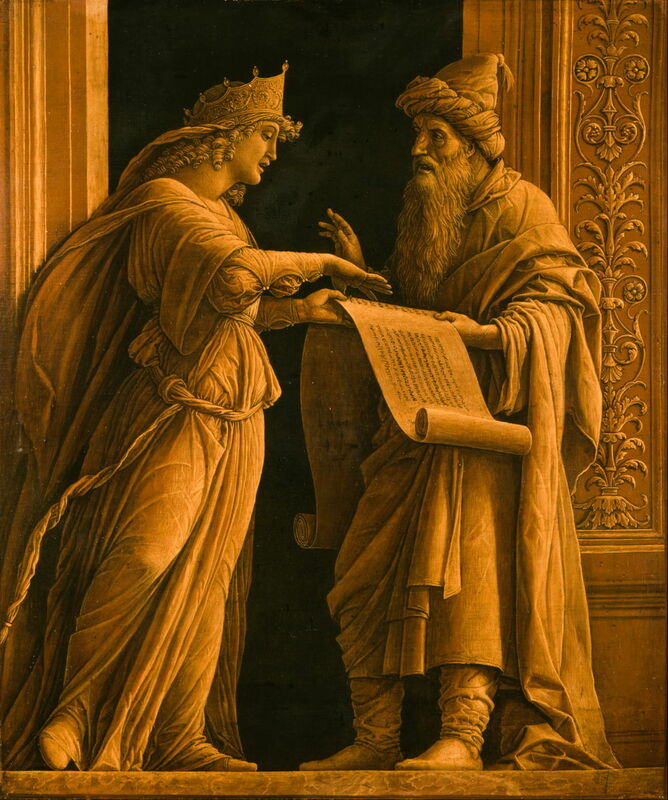 His sibyl wears a crown, and is sharing written prophecies with her male counterpart. Pietro Perugino (1448–1523), The Almighty with Prophets and Sibyls (1497-1500), fresco, 229 x 370 cm, Collegio del Cambio, Perugia, Italy. Wikimedia Commons. By the time of the major fresco paintings at the start of the sixteenth century, sibyls and prophets were strongly associated. 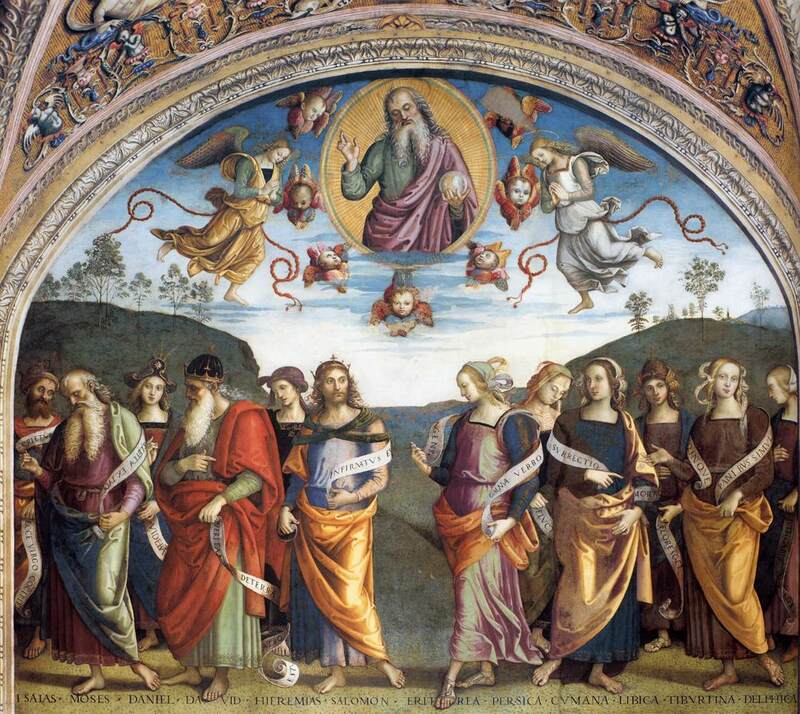 This is Pietro Perugino’s fresco in the Collegio del Cambio, showing The Almighty with Prophets and Sybils, painted between 1497-1500. At the left are the traditional prophets of the Old Testament, and at the right are six sibyls, each clearly captioned. Michelangelo (1475-1564), Delphic Sibyl (1508-12), fresco, dimensions not known, ceiling, The Sistine Chapel, The Vatican City. Image by Jörg Bittner Unna, via Wikimedia Commons. 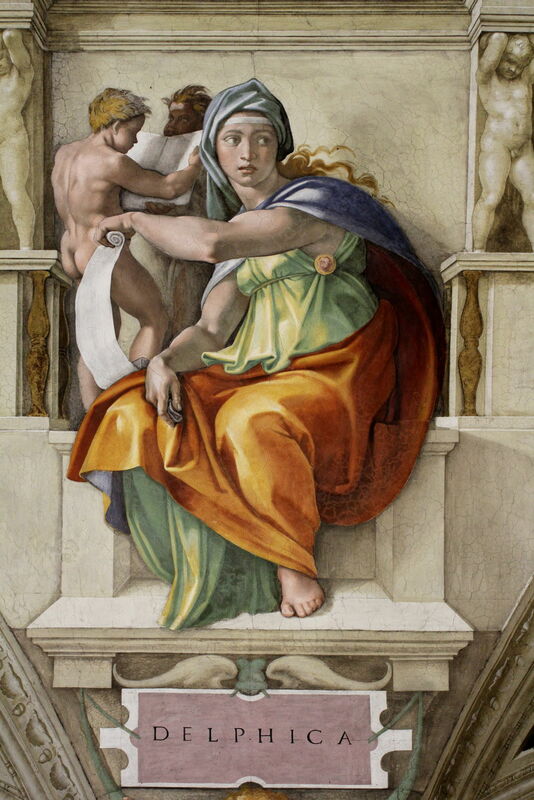 On the ceiling of the Sistine Chapel, painted between 1508-12, Michelangelo included the Delphic Sibyl. She has a characteristic headdress, a scroll, and that same slightly crazed faraway look expected of a seer. 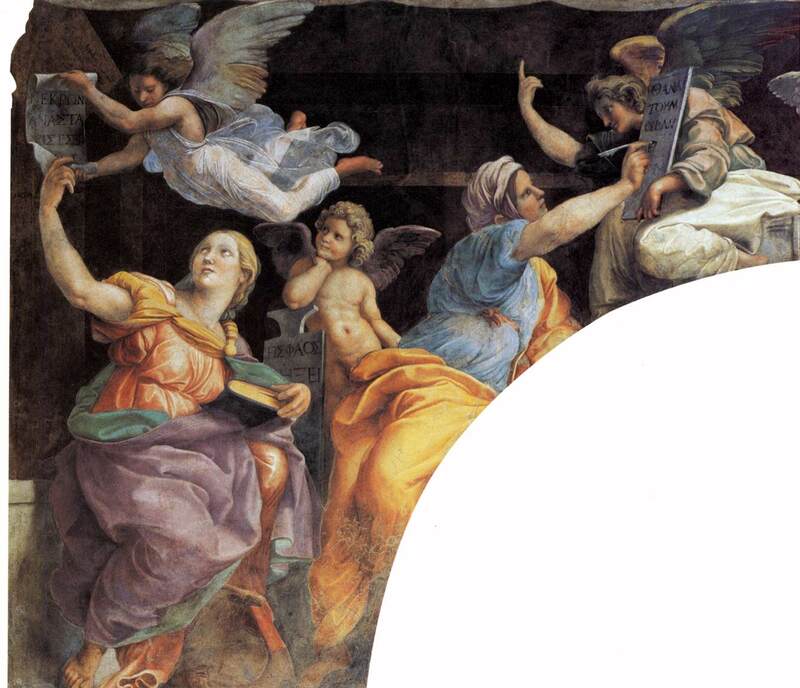 Raphael (1483–1520), The Sibyls (detail) (c 1514), fresco, width 615 cm, Santa Maria della Pace, Ponte, Italy. Wikimedia Commons. Raphael wasn’t to be outdone in his fresco in Santa Maria della Pace. Arched over a door, he painted The Sibyls in about 1514. The left side is shown above, and right side below. He shows four sibyls in their uniform headdress and robes, aided by winged angels, reading from and writing to tablets, a scroll and a book. Dosso Dossi (c 1489–1542), Sibyl (1524-25), oil on canvas, 69 x 64 cm, The Hermitage Museum Государственный Эрмитаж, Saint Petersburg, Russia. Wikimedia Commons. 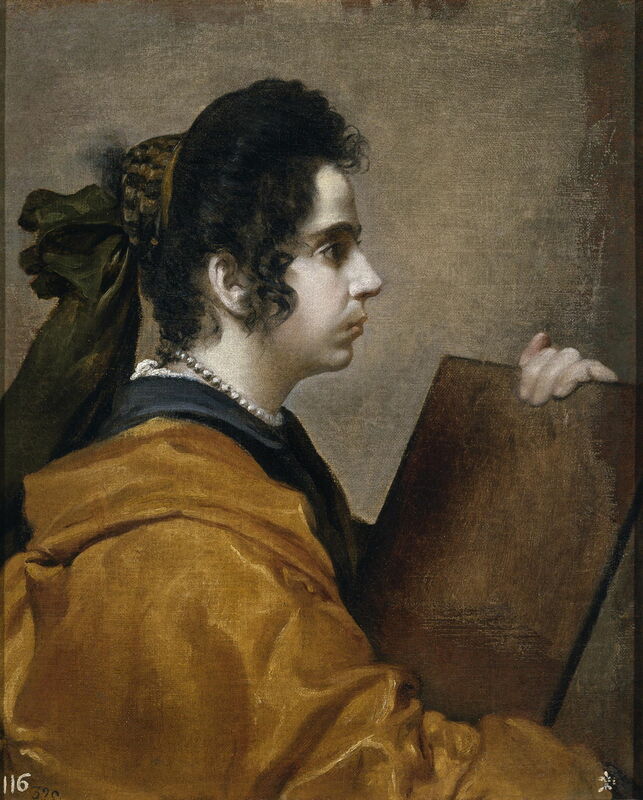 As easel paintings on panels and canvas became more prevalent in the Southern Renaissance, sibyls appeared there too. Dosso Dossi’s Sibyl from 1524-25 is the first of a long line of easel paintings showing a single sibyl with her headdress, exotic robes, tablet, and prophetic gaze. Francesco Bacchiacca (1494–1557), Sibyl (c 1525-50), oil on panel, 70 x 54 cm, Kunsthistorisches Museum, Vienna, Austria. Wikimedia Commons. Some of these early easel paintings showed highly inventive forms of headdress, as in Francesco Bacchiacca’s Sibyl painted in about 1525-50. Maarten van Heemskerck (1498–1574), The Erythraean Sibyl (1564), oil on oak panel, left wing of a triptych with the donor Matelief Dammasz and St Paul, 123.5 x 75.5 cm, Rijksmuseum Amsterdam, Amsterdam, The Netherlands. Wikimedia Commons. 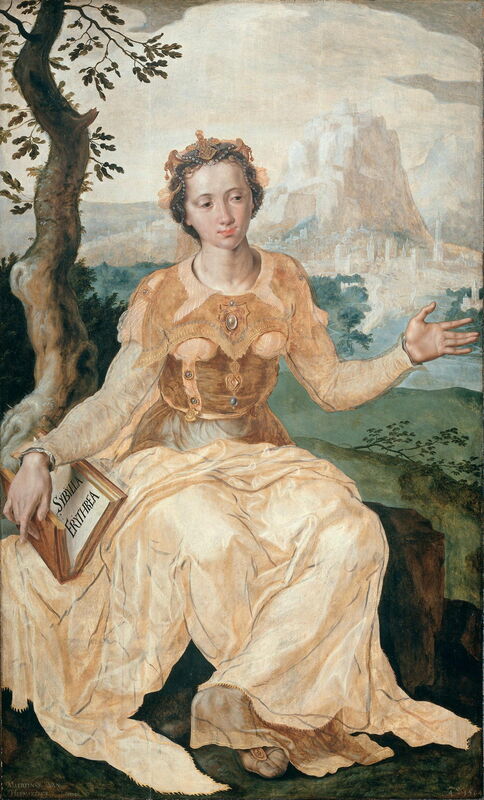 When Maarten van Heemskerck painted The Erythraean Sibyl in 1564, he may have had the benefit of access to the Sibylline Books. He kept with the formula for attributes, though: headdress, exotic robes, open book inscribed to tell us who she is, and her distant gaze. Artist not known, Egyptian Sibyl (before 1626), oil on canvas, 61 x 44.4 cm, Dulwich Picture Gallery, London. Wikimedia Commons. This anonymous British painting of the Egyptian Sibyl is one of a set which was completed before 1626. Against these, Diego Velázquez’s Sibyl from 1630-31 remains well within convention: headdress, robes, writing tablet and gaze. The only slight puzzle is why there are no prophetic words on her tablet. 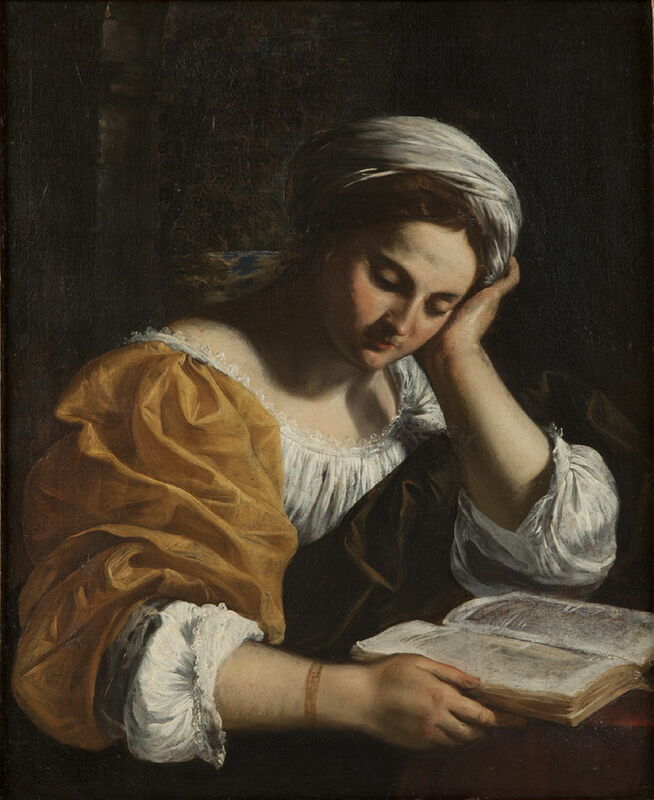 Simone Cantarini (1612–1648), Reading Sibyl (c 1630-35), oil on canvas, 72 x 59 cm, Private collection. Wikimedia Commons. Simone Cantarini’s Reading Sibyl from about 1630-35 is more modern in appearance, with a proper printed book, and the fabric of her clothing beautifully executed. 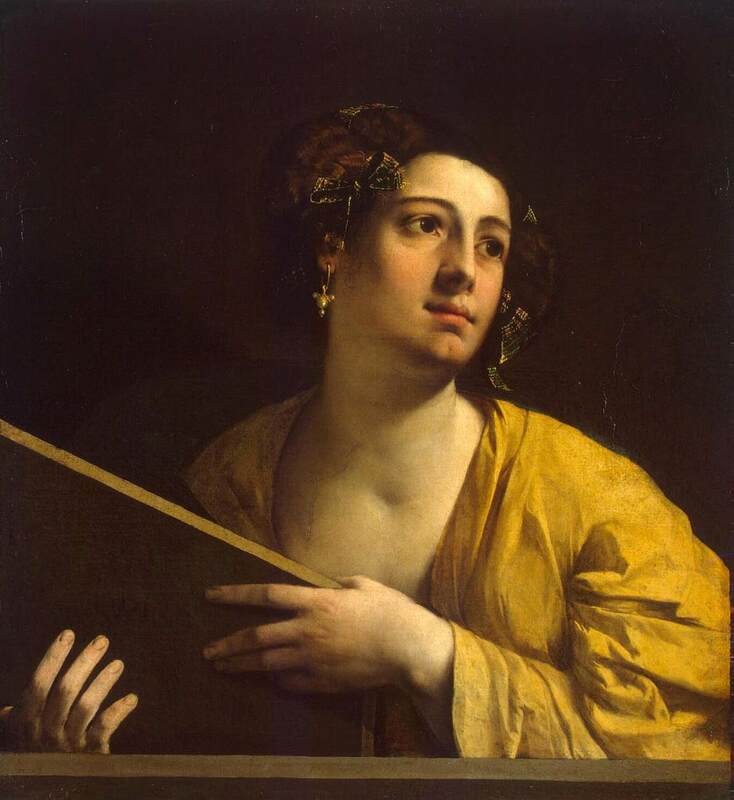 Guercino (1591–1666), The Persian Sibyl (1647-48), oil on canvas, 117 x 96 cm, Musei Capitolini, Rome, Italy. Wikimedia Commons. 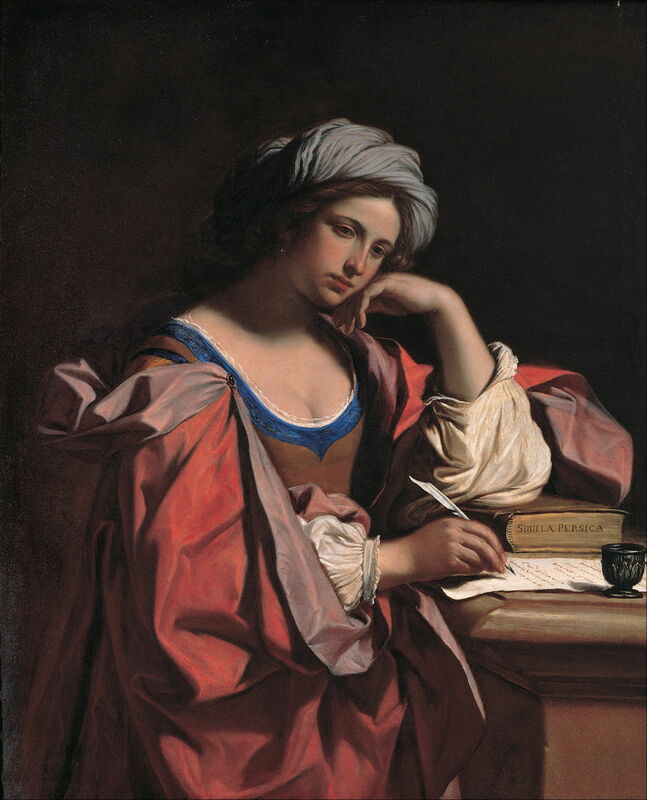 By the middle of the seventeenth century, when Guercino painted this portrait of The Persian Sibyl (1647-48), the craze for sibyls was rapidly dying. 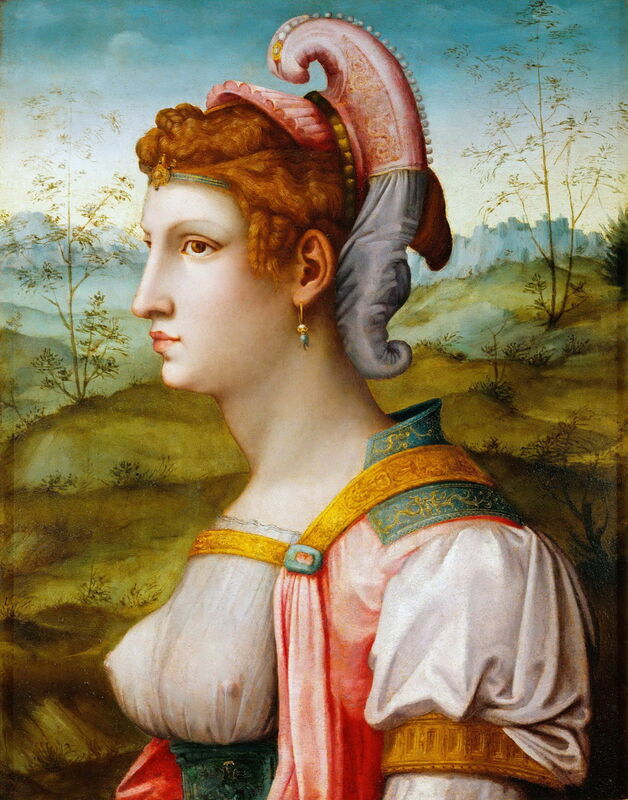 In the next article, I will show some more recent paintings of sibyls, and a special sibylline theme. Posted in General, Life, Painting and tagged Bacchiacca, Cantarini, Dossi, Ghirlandaio, Guercino, Mantegna, Michelangelo, painting, Perugino, Raphael, van der Weyden, van Heemskerck, Velázquez. Bookmark the permalink.